- hmm checked the entire upper dam. i think the dam is secretly a library. keep finding books but not hammer. you'd think a big metal and rattle building would have a useful big hammer. they just have books. Neeerds! - Left the guts to cure at the dam but have taken the hide with me. - Waited out a cold morning. There is a wolf rubbing against the trailers anyway. - Read an hour of wilderness kitchen and left it at the trailer. - The cold got replaced by moderate fog once I snuck out. - Took the route that leads along the rail tracks back to the lake cabin. Didn't see the red wagon guard wolf but it was both foggy and cold along the way. - Once I reached the lake cabin, read the fishing book and then went out to grab all my fish from the fishing hut. Going to eat all this fish tomorrow before departing for the Muskeg forge. That is impressive! Seems like you precedent loper runs did not at all rely on being starved and sleep-healing, congrats! @BareSkin Thank you. Though, I've been saved by heal sleep from red zone multiple times. That's something you cannot get away with in Sleepwalker so easily. I'm certainly glad I haven't ran into red zone yet. What I find easier in Sleepwalker is vigilant sleeping that includes going 2h at a time if you're doing it in the car or cave without a fire. In other mode you basically lose a night of healing when you do this. - Cold morning. Read an entire fishing book. - It's -5C when I decide to go for it in the afternoon. Mornings are cold anyway so I can't start a long trip in the morning anyway. - Seems the railway wolves are having a party. This one isn't there. Lucky break. - Entered Muskeg and reached the red wagons not chased by anything. Saw a wolf in the distance that seemed disinterested and a bear in the distance too. - It got horrendously foggy. Oh no. I really didn't want to waste fuel by getting stuck for the night. - Started a fire at the barrel since I started to freeze at this point. - Slept an hour or two several times, boiling water and coming out during the middle of the night to harvest some bushes for sticks and twigs. - It's -40C in the morning. Yuck! Wolves are howling everywhere. I don't think they're into this weather either. - By afternoon it got to -12C but moderate fog came back. Muskeg has decided to be difficult. - Meh this. I'm not burning up all my coal to stay full day and night. - Pulled out two torches, stingy barrel 24% both. Meh started walking. - Admittedly lost since I'm trying to cross via isles. - Picking up twigs as I got along. Grabbed some cattails, but not all since I want to hurry. - Eventually ended up at hunter's blind and found one accelerant. - Kept going encountering weak ice a few times but backing off timely. - Sprinted across some weak ice to get to the bank and reached the spot where a few ruined buildings are not far from the forge. - Had to start another fire and check them out before patrol wolves got here. Wow not even a piece of metal. Nothing. At least the last fire gave me 44% torches. - Two wolves are hanging around the forge. Cute. Got to be sure not to walk around in the fog. - Since I had quarter of stamina left and was freezing began firing up the stove. - Got last piece of tinder too after those fails. Used accelerant to fire up the bloody stove before I freeze since hypoth got me near the farm. - Woot! Lvl 2 Fire Starting at last! - Crafted one hatchet with a bit of stamina left and slept 10h. HUUURAAYY!! My first hatchet!!!!! - Might as well listen to a blizzard while I craft a second hatchet. - Broke some green boxes. - The safe had money, heh might as well use tinder. - 87% ski jacket! Nice! - Brown eeky fog after blizzard. Lovely. - Ate 18% dog food and didn't get poisoned. Slept. - Got another knife done. - Managed to sneak out and look around to collect firewood. The double wolf patrol is perked up and vigilant. - Went along the docks to the barn and a house buried up to the roof in the ground. - Found a lantern and a bit of metal. - Chanced taking a hide and meat off a deer. This drew attention of those two wolves and they both sprinted towards me. - Dropped meat decoy and backed off a few steps before starting a fire with the accelerant. The wolves fled. They have gotten very close to me. That was extremely dangerous. - Collected dropped meat and cooked it. Ate it before returning to the forge. - Hacksawed a metal shelf at the back and more crate busting. - Worked on the arrowheads. - Blizzard replaced by brown fog. Yuck. - Mad that a knife was wasted on opening dog food. I have lvl 3 skill now and don't lose calories by smashing cans. That's annoying that hatchets and knives get wasted on cans without permission. - Finished arrowheads and found one more metal. I should have 20 arrowheads when that's done. - It's too late and not weather great to leave. - In the evening went out to collect firewood. - Got too tired running around. Didn't get started on sewing primer which I found by the bed. I'd be glad in you explained why you crafted this or that, and in what numbers. I never crafted a hatchet in a Loper+. I always end up with 2 knives tho, just from paranoia. Since I'm not a great bow and arrow hunter nor can I hit bunnies with stones, my best bet to survive off the land is to settle either Coastal or Mystery Lake near the fishing cabins. Fishing is my primary mode of getting food. However to fish you have to have a lot of firewood otherwise you'll freeze in the fishing hut. Hatchet is very much a must to chop wood and I'll be using it often. I try my best to get enough twigs but sometimes you just need big logs if you want full day fires or if you're going to live somewhere for a while twigs may run out. I guess I craft two more because in the future I don't want to take a huge risk running back to the Forge if something happens to the hatchet. When my character goes fishing it's usually a one full day affair morning to evening which requires preparation of grabbing coal and lots of firewood. Knives are used for smaller tasks like carcass harvesting or for cloth like pillows or old bedroll you have to have a knife. They're also helpful, two because what if it breaks. My current goal for any Loper game is 100 days. My plan is running around until I get a bedroll to hide in fishing cabins while cabin fever and fish and sleep there. Then to get a hammer and run to Forge to craft pretty much everything. While I'm executing this plan in parallel I try to grab good clothes or to craft them if opportunity arises like if I'm passing by a deer and I could grab guts for fishing lines and the hide. Obviously to craft I also need 20+ metal. So early game I try to get a hacksaw along with the hammer. 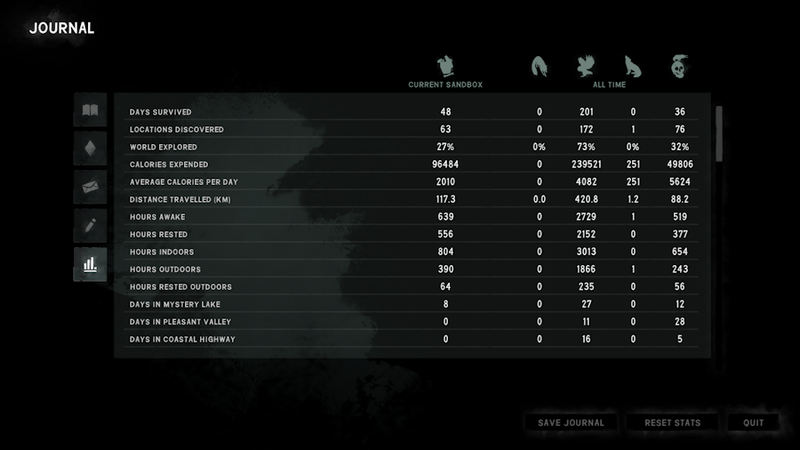 I tend to carry 20+ metal to the Forge to do 3 hatchets, 2knives and as many arrowheads as possible in one go. Both Muskeg and DP are dangerous trips best minimized. I find hatchet to be probably a number one tool in multi use so I try to grab a few to feel more secure in the future when the weather gets harsh. That's exactly why in never do the hatchet: I never chop woodpieces. Faced with the same problem, I went the bow path. Learned the hard way how to use it. Namely, starvation. @BareSkin Starvation certainly prompts you to be creative. - I have 23 cattails. That's not much to live on in this mode. I must return to the Mystery Lake. - I'm also running short on sticks. Two ninja wolves are making them difficult to gather. - Closer to noon drank some tea and grabbed a torch to get going. - Mildly windy and around -20C The torch is holding. - The wolves are howling, but at reasonable distance, though I had to take evasive action with one before he saw me. - Really didn't want to stop at the red wagon but I had to because hypoth dropped on me as I entered it. - Got lucky, my last torch was at 9% and the fire lit up in one go. - Don't want to use coal so the temp with the sticks fire barely climbed over +1. Slept an hour for additional warmth after crafting more tea and drinking it. - Grabbed sticks around the red wagon since I'm completely out and dropped them in to make more torches. Crafted another tea. - Began walking along the tracks towards the Mystery Lake. It's not far now. For some reason decided to take a detour left to grab mushrooms and cattails. - Warmth buff ran out as I did so and temp began to bite. It got darker and snow began falling. - Not seeing the wolf along the railway, decided to go for the lake cabin. - He is actually there but far down the tracks, too close to the cabin for my liking. Had to climb a hill and hypoth got me. - Visibility dropping and snow increasing. The moon is out when I goat down the hill to the lake cabin. - The health did take some beating but I'm home with 3 hatchets, 2 knives and 20 arrowheads. *happy survivor dance* I ran, I forged, I conquered! - DING! LvL 4 cooking! Wow! I'm a great cook! - Yup, I was right, a blizzard starts howling. - Crafted more arrow shafts and arrows. - he's still getting closer.... closer... CLOSER! - well this is weird. according to the marks the bear made a circle and ran back along the same route. except i've been following that route precisely and he should have ran into me, shouldn't he have? - My health was high when he jumped and the clothes aren't that poorly armoured. - It was a long fight. - For a moment he looked hesitant like he was going to disengage. - And then he won the struggle. Oh, here's you're first bugged-bear death. Welcome to the club! Died there once, harvesting a deer carcass, then suddenly the bear appeared from nowhere (underground?) and charged me. Long story short, he did die, and I did survive, cause I was nearby a fire and the attracted wolf flew away. Should you try another one later, I'm pretty sure I'll have to make a diploma soon enough! It went better than I thought. I actually lasted longer than regular Loper game too so far. That pond is very dangerous in general. It's not the first time something ambushes me near it and kills too. Maybe I should do Deadman to make SW0 look comfortable in comparison.